Some people do not even realize that SAS makes shoes for MEN. I have to admit that as far as my blog is concerned I have not posted as much about SAS's Mens Line as I have the Womens, and I must apologize for that. SO, let me start 2013 with what SAS has to offer gentlemen. 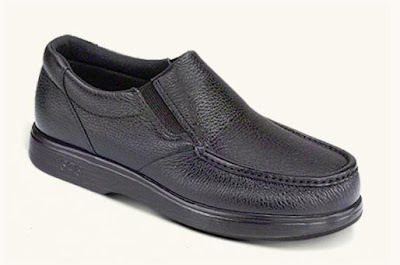 ACE has been one of our most popular slip-on dressier shoes. It is very lightweight and super comfortable. 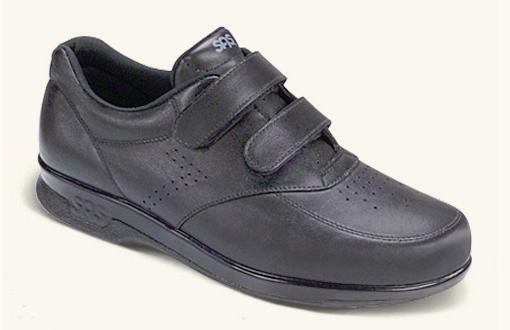 Ace is available in Black only in Narrow, Medium and Wide widths. 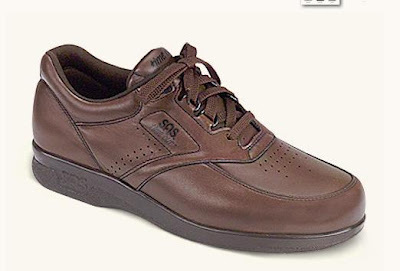 AMBASSADOR is SAS's newest shoe for Men. You can read all about Ambassador on my blog. Ambassador is available in Black and Brown in Narrow, Medium and Wide widths. BOUT TIME is a style that we have had for a while, but is one of our top selling shoes period. Lightweight with a broad base and roomy toe box - what's not to love. Bout Time is available in Black, Cordovan and Mulch (Brown) in Slim, Narrow, Medium, Wide and Wide-Wide widths. SIDE GORE is SAS's slip-on version of Bout Time. 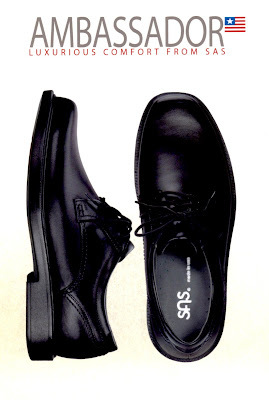 Side Gore is available in Black and Cordovan in Slim, Narrow, Medium, Wide and Wide-Wide widths. 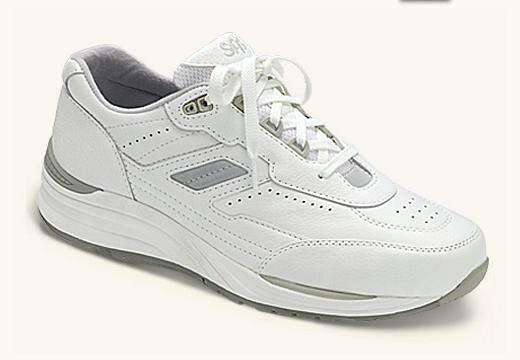 TIME OUT is SAS's top selling, most comfortable, supportive shoe. You can read about all about it on my blog. Time Out is available in Black and Walnut in Slim, Narrow, Medium, Wide, and Wide Wide widths. Black is also available in 3 Wides. VTO is a Velcro version of Time Out. VTO is available in Black and Bone in Slim, Narrow, Medium, Wide and Wide Wide widths. Black is also available in 3 Wides. JOURNEY is part of SAS's Active Comfort Line. You can read all about it on my blog. Journey is available in White and Black Smooth Leather in Slim, Narrow, Medium, Wide and Wide Wide widths. Journey is also available in a Suede/Mesh Combo in Gray in Narrow, Medium and Wide widths. 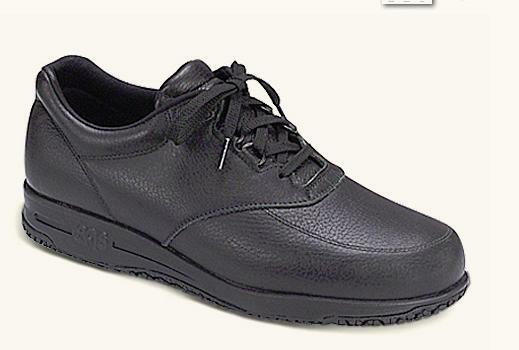 GUARDIAN is a slip-resistant shoes designed for those who work around wet conditions such as in the restaurant or hotel industry designed similar to Time Out (above). You can read all about it in my blog. Guardian is available in Black in Slim, Narrow, Medium, Wide and Wide Wide widths. 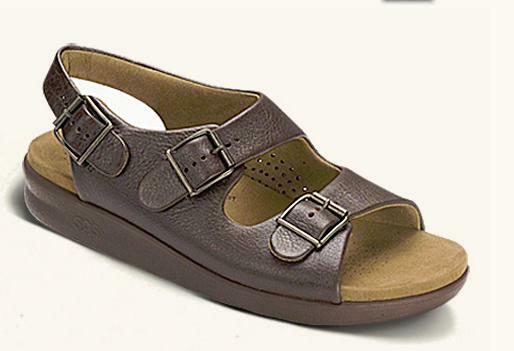 BRAVO is SAS's Men's version of Relaxed (one of SAS's top selling sandals for ladies. Bravo is extremely lightweight, has a broad base and superior arch support. It comes with three adjustable straps for fit and comfort. Bravo is available in Brown in Narrow, Medium and Wide widths. 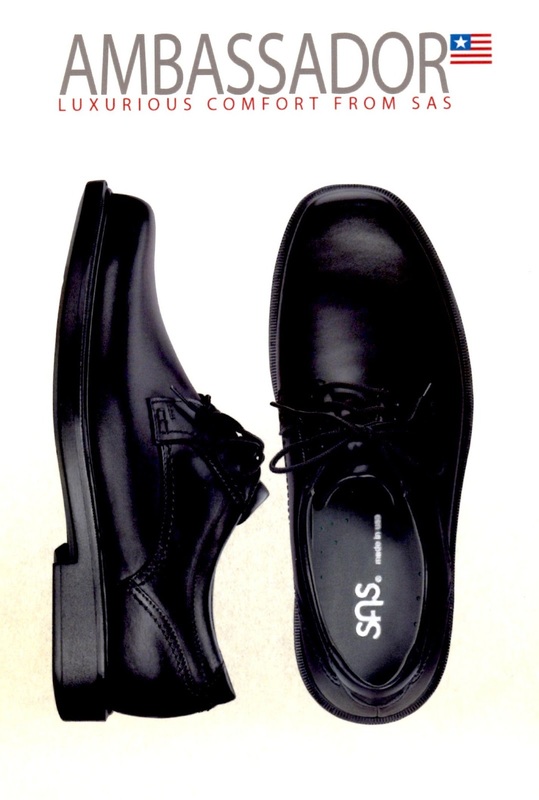 So, there is SAS's complete line of shoes for Men. The same quality that goes into their ladies shoes goes into their mens. All are designed with comfort, support and durability in mind. WATCH FOR OUR FALL '13 ARRIVALS. 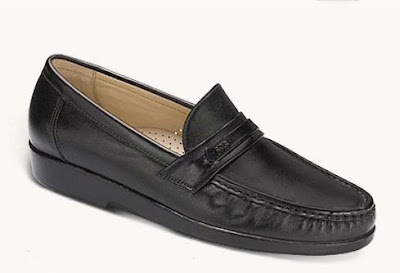 AMBASSADOR in Brown and it's Slip-on Cousin DIPLOMAT in both Black and Brown.